Archives & Special Collections, in partnership with Student Life, will have a rotating LGBTQ exhibit on the second floor of the Student Union this semester. The first installation is currently up and displaying the Fifth Freedom newspaper. 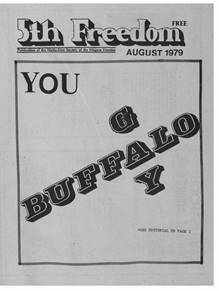 The Fifth Freedom was a periodic free newspaper of the Mattachine Society of the Niagara Frontier, Western New York's most prominent early gay rights organization. In being the official written mouthpiece of the region's first systematic gay rights organization, The Fifth Freedom expresses the earliest codified and widely distributed literature of the gay community within the region. Covering the time period between 1970 and 1983, the literature of The Fifth Freedom necessarily comments on not only the self-expression of a largely "invisible" self-identified group in the years that followed the Stonewall riots and preceded the onset of the more well-known AIDS epidemic, but also upon the larger Western New York and American culture overall. For more information on the exhibits, please see the article in The Daily Bulletin. In addition, you can read the full issues of the Fifth Freedom newspaper on the Digital Commons. Posted on behalf of Hope Dunbar, Special Collections Archivist.